San Diego Surf midfield Mia Fishel scored the go-ahead goal as the U.S. assured itself a berth in the FIFA U-17 Women’s World Cup with a 3-2 victory over Haiti Sunday in a semifinal of the CONCACAF Women’s U-17 Championship. Fishel flicked a hard pass over her defender with her heel, then swiveled around her to follow the ball. A second Haiti defender attempted to head the ball clear but didn’t get enough on it and the ball fell to Fishel, who volleyed a point-blank shot down into the middle of the goal in the 49th minute to give the USA a lead it would not relinquish. 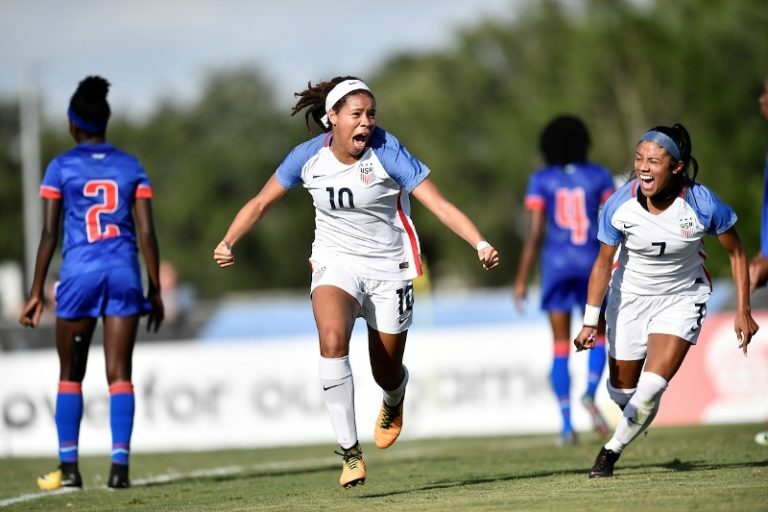 The U.S. increased its lead to 3-1 one minute later when Reilly Turner headed down a perfect pass into the path of Sunshine Fonts, who fired a shot from the top of the six-yard box past charging Haiti goalkeeper Madeline Fleur. Melcher Dumonay scored for Haiti two minutes into stoppage time. Dumonay opened the scoring in the 13th minute on a more than 30-yard free kick. The U.S. tied the score in the 32nd minute on Fonts’ shot from 10 yards out. The U.S. led in shots, 15-7, and 7-4 in shots on goal. U.S. goalkeeper Angelina Anderson made two saves. Fleur made four. Both semifinal winners and the winner of the third-place game are assured of berths in the FIFA U-17 Women’s World Cup. The U.S. (4-0-0) will face Mexico (3-0-1) Tuesday in the tournament final. Haiti (2-1-1) will face Canada (2-2-0) in Tuesday’s third-place game. The tournament is being played at the IMG Academy Soccer Stadium in Bradenton, Florida.